The Fall Classic makes its return to Queens tonight, when the New York Mets play the first World Series game at Citi Field, which opened in 2009. And Delta is giving some ticket holders a unique way to get to the ballpark just south of Flushing Bay. 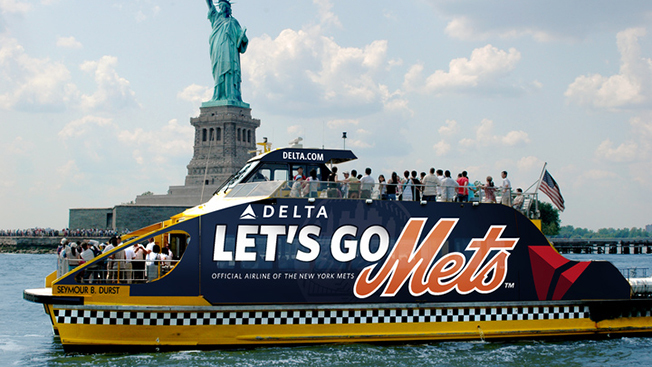 As the Mets attempt to claw their way out of an 0-2 hole against the Kansas City Royals, Delta will operate a branded water taxi, Delta's Amazin' Mets Express, that will take fans to the games on Friday and Saturday. "The idea originally started out as a bus," said Bill Betz, general manger of sponsorships and brand activation at Delta Air Lines. "But that thing would end up in traffic all day long." For fans lucky enough to catch a ride on the water taxi tonight, Mets legend Mike Piazza and comedian and Mets superfan Jim Breuer, who gained notoriety for his Facebook posts following Mets games this season, will join them. Betz said they don't have a celebrity guest for Saturday's Game 4, joking that "Halloween night in New York is enough on its own." To give away tickets for each of the two nights, Delta and the Mets staged a social scavenger hunt yesterday. The two tweeted out clues to help fans find tickets. This is not the first time Delta has taken flight with the Mets' World Series run. Shortly after the Amazins clinched the National League East title in September, Delta unveiled a "Let's Go Mets" branded aircraft. The Atlanta-based airline is making a big push into the New York market, having expanded terminals at both JFK and LaGuardia Airports in recent years. Earlier this month, Delta re-upped its deal with the Mets and Yankees as the official airline of both clubs through 2023. The Mets deal maintains Delta's sponsorship of the 22,500-square-foot Delta Sky360 Club at Citi Field and will add brand integration within the official ballpark app. "As we finally got to the World Series, we realized that we had this fantastic opportunity to go out and really show our support for the team," said Betz.